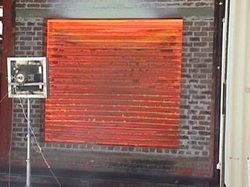 Fire resistant roller shutter doors are the most effective way of greatly reducing or containing the spread of fire. Designed to provide a fire resistance rating of up to 240 minutes with respect to the integrity criteria of BS:476 Part 22 1987. Fire Shutters are used where there is a high fire danger or open areas where a fire cannot easily be contained and close automatically at a controlled rate when activated to prevent fire from spreading. The GB fire shutter may be installed in a wide variety of applications where fire protection may be required, such as shopping centres, hospitals, car parks, supermarkets, office blocks and especially factories / warehouses where flammable materials are stored and used. The shutters may also be used as secondary protection for other doors and windows.